So, trying to make along story short…I was doing animations in college. They were getting longer and longer so I needed to start actually scripting them. I took Screenwriting 101. I had no ideas at all for feature screenplays (which was really embarrassing as the kindly professor insisted that everyone in the class should talk about their top 10 (!!!) ideas and hash out which one to work on). I made a very poor first impression. But in desperation I wrote a script based on my experiences in the military (USMC 1969-70) and the kindly professor loved my work. He started a publishing company and published my script as his first book. The book got reviewed in the Hollywood Reporter. Agents called me. I moved to L.A. to start banging my head on the Hollywood Wall. A very hard wall indeed. 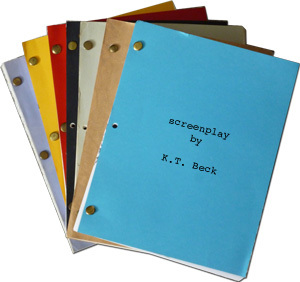 Through the years I ended up writing 30 feature screenplays. I made money on a dozen of them (options, development money, or re-writing for hire), but none were produced. So there they sit in my file cabinet and I get the bright idea. Hey! Why not put some of them up on this lovely new Web site and let folks read them for free? Cool! Lots of the scripts are encumbered in one way or another (co-writers; possible squabbles about ownership from folks who hired me to do the writing) and those won’t be going up. But the stuff that is mine and that I think might be interesting for someone to read might make the cut. Go read some of my “Angle On” stories that might change your mind about hitting the Hollywood bricks. Keep in mind that none of these puppies got made. Colter – 1806: John Colter, a cocky young explorer with the triumphant Lewis & Clark expedition, decides to remain in the remote, untamed Rocky Mountain/Yellowstone wilderness. His true story is one of incredible adventure, romantic love, and awe-inspiring feats that hugely influenced the next 100 years of the American West. It has never been told on film before. “…perhaps the greatest untold American story.” Stephen Ambrose (Band of Brothers, Undaunted Courage). Dog Star – Everybody’s life improves when an unusually talented dog brings True Love to Anchor Bay. You’ll meet Nick, the shy boat-builder yearning for Carlene, the pet-store owner; there’s Corky, ace drummer who’s freaked out about his upcoming wedding to Wanda, the realist who focuses his beat; there’s Charles, who wants to buy the pet store with the love of his life, Robert, the master carpenter; there’s Roma, the gourmet chef, and Ted, the plastic toy magnate. And there’s the charismatic mutt who magically makes it all happen. Street Justice – Supreme Court Justice Alan Church Mayhew, on the run from a deep-seated government conspiracy, must uncover the fate of his long-lost brother to clear his own name. Forced to live on the streets, he becomes more than a fugitive as he uses his talents, background, and few remaining contacts to aid those struggling on the bottom rung of society, while fighting to reveal a vast and dangerous truth.